Coconut oil is often used only for cooking, actually there are so many benefits of coconut oil for health and beauty. In fact, also mentioned that coconut oil can also be used to treat acne. Because 50 percent of coconut oil content is lauric acid that supports healthy metabolism and has studied the content has anti-fungal, anti-viral and anti-bacterial. In addition, coconut oil also rich in vitamins, such as vitamin D, E and K.
Coconut oil generally get a bad assumption because it contains high saturated fat. However, in fact there are also many benefits of coconut oil, especially virgin coconut oil (VCO). Unlike the vegetable oil, VCO containing 92% medium-chain fatty acids can continue to be absorbed through the intestinal wall when it is in the gastrointestinal tract, the process is faster because without due process and enzymatic hydrolysis. Furthermore supplied directly into the blood stream and was immediately taken into the liver to metabolized. VCO is processed in the liver into energy, not cholesterol and fat deposits, the energy is used to improve the function of all endoktrin glands, organs and tissues. Like what we have mentioned above, quoting from wikipedia, Coconut oil contains a large proportion of lauric acid, a saturated fat that raises blood cholesterol levels by increasing the amount of high-density lipoprotein (HDL) cholesterol and low-density lipoprotein (LDL) cholesterol.This may create a more favourable blood cholesterol profile, although it is unclear whether coconut oil may promote atherosclerosis through other pathways. Because much of the saturated fat of coconut oil is in the form of lauric acid, coconut oil may be a better alternative to partially hydrogenated vegetable oil when solid fats are required. In addition, virgin coconut oil (VCO) is composed mainly of medium-chain triglycerides, which may not carry the same risks as other saturated fats. Because it is rich in lauric acid, coconut oil consumption can protect the heart by lowering bad cholesterol and increase good cholesterol. A study has proven that potent virgin coconut oil consumption lowers the risk of cardiovascular disease. 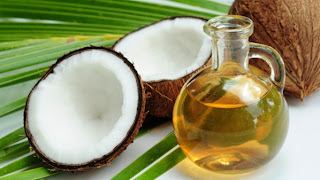 Virgin coconut oil will not trigger an increase in the hormone insulin in the blood vessels. Conversely, consuming coconut oil can help you control your blood sugar by increasing insulin performance. Lauric acid content in coconut oil is enhancing good immune system. Several studies also have shown that consuming coconut oil is able to maintain brain health in old age. Panamanian people like to drink pure coconut oil to treat diseases and accelerate the healing process. Consuming virgin coconut oil and vitamin E together is the solution for treating failure nutrient absorption in the digestive tract. Virgin coconut oil also contains caprylic acid which is known to kill harmful bacteria. Rub on chapped lips. You can also use it to keep moisture lip anywhere, but not during the summer, as the heat will melt the oil. Coconut oil is anti-microbial agents, anti-fungal, and anti-bacterial. So apply coconut oil on the face as a moisturizer for anti-aging properties and prevent acne. If you frequently disturbed by the presence of stretch marks, apply coconut oil for a few weeks until able to eliminate them completely. If you want long hair quickly, just apply coconut oil to hair roots. The process is almost the same as how to cope with split ends. Lauric acid is said to cure acne, a good choice for oily and combination skin.